La Scena Musicale: Gustavo Dudamel and the LA Philharmonic: A New Era Begins! Gustavo Dudamel and the LA Philharmonic: A New Era Begins! It seems like yesterday that Esa-Pekka Salonen announced he was stepping down as music director of the Los Angeles Philharmonic, to be succeeded by the young Venezuelan phenomenon Gustavo Dudamel. In fact, it was two years ago, in April, 2007. This month, Dudamel conducted his inaugural concert as music director of the LA Phil and a few nights ago, PBS broadcast the historic event to viewers around the country. On the whole, it was an excellent concert and gave the country a good look at the charismatic Dudamel. Will Dudamel’s Appointment Build Hispanic Audience Base? It was a stroke of genius by someone (Salonen? LA Philharmonic executive director Deborah Borda?) to grab Dudamel for LA; the city is more than half Hispanic and Latino and if the orchestra is to flourish in the 21st century, it will have to connect with that community. In his work with the Simón Bolívar Youth Orchestra of Venezuela, Dudamel has demonstrated a rare gift for making music and for making music meaningful and exciting to Spanish-speaking listeners. I had expected that Dudamel’s opening concert in LA would reach out to the Latino community in a big way. Surprisingly, this side of Dudamel was conspicuous by its absence. Instead, we got the premiere of a new piece by John Adams and Mahler’s Symphony No. 1. PBS had hired Andy Garcia as host for the broadcast. Hollywood celebrities Tom Hanks, Quincy Jones, Sidney Poitier and others were in the audience, but few recognizable stars from LA’s Latino community were caught by the camera. Very odd. For the occasion, the LA Philharmonic commissioned a major new piece from one of the best-known and most respected American composers, John Adams. Adams’ City Noir is a 35-minute symphonic suite inspired by Los Angeles generally and by Hollywood film noir of the 1940s specifically. Adams also alluded to the influence of the 1950s television series Naked City in remarks included in the broadcast. Adams talks a good game, but all too often his music is disappointing – at least to me. City Noir was no exception. Last year, I sat impatiently through the pretentious Adams opera Doctor Atomic at the Met. City Noir proved to be just as much of an ordeal. Other composers might have borrowed from the film scores of Bernard Hermann, for example, as a point of departure. They might have tapped into the work of all the great composers who have chosen to live in LA over the years – Stravinsky and Schoenberg being the most notable. Given the demographics of LA and the fact that it was Dudamel’s debut concert as music director, surely some celebration of Latino music would have been in order. Instead, we got endless impressionistic noodling and flat-footed uninspired rhythms. Finally, at the very end of the piece, the Latin percussion was brought into play, contributing to what sounded like an inferior rendering of the end of Stravinsky’s Le Sacre du Printemps. Either Adams has no comprehension of the essence of Latino music, or he deliberately neutered it in favour of some kind of abstract and distorted version of it. Dudamel appeared to conduct City Noir with great efficiency but then any number of conductors could have delivered the same level of competence. The piece was a huge disappointment and a great missed opportunity to say something relevant to the occasion. Many patrons may well have hit the bar at intermission wondering what all the Dudamel fuss was about. Fortunately, the best part of the evening was yet to come. Only 28-years old, Dudamel already has a long history with Mahler’s Symphony No. 1. He says it is the first piece he studied with his mentor José Antonio Abreu, the legendary founder of the ground-breaking El Sistema in Venezuela, and he has conducted it with leading orchestras around the world. In this performance, Dudamel had the players in the LA Philharmonic on the edge of their seats and many in the audience too. But while he has a well-earned reputation for generating excitement, Dudamel’s Mahler was also well nuanced. I was greatly impressed with the maturity of his approach. even if I didn’t always agree with his decisions about tempo and phrasing. But there was no doubt about it. He had a point a view about the piece and it was consistently engrossing. His phrasing was often personal, but it was never self-indulgent or tasteless. He reveled in the sounds of nature that Mahler incorporated in the first movement, but treated them with subtlety and with a fine ear for balances. The beginning of the second movement was the most controversial feature of Dudamel’s interpretation of the Mahler First. He took the first four bars very slowly, with heavy emphasis, before moving into a quicker tempo. I don’t know where he got this idea – there is no marking in the score to justify it – but I have to say that it made this quirky dance movement even more fun than usual. To my ears, the last movement is too long and repetitious in almost anyone’s performance, but Dudamel kept it going and with some tremendous playing from the horn section, got just about all the excitement one could ask for. Earlier this year, I was in the Disney Concert Hall for one of Salonen’s last concerts and it was a wonderful experience. Salonen is an outstanding composer-conductor and the hall is excellent. A broadcast, even in HD, is not the same as being there, but some of the acoustical splendor of Disney came through nonetheless. I was particularly struck by the sound of the bass drum. Even the soft notes had a wonderful resonance. On the other hand, the big climaxes never registered properly. But that was not the fault of the hall; it is an old problem with television sound. The limiters on the transmitter make sure that nothing is too loud or too soft. But this concert was recorded by Deutsche Grammophon and I am sure the DVD will sound a lot better. LA Phil – Give Us the Dudamel We Know! I mentioned at the outset that Dudamel was an inspired choice to lead the LA Philharmonic because of his Latino roots and their Latino needs. I also said that I found his inaugural concert somewhat disappointing because this Latino theme was totally ignored. Going further, I had the feeling that he had reined in his conducting style for the occasion. There was far less grimacing than we get in even the average Simon Rattle concert, and nothing like the hopping and jumping that made Leonard Bernstein such a popular podium personality. Even the hair seemed to have been cut back to suggest greater maturity. But it could be that this image tweaking was a deliberate strategy. With the world watching, Dudamel was presented not as a Latino phenomenon. but simply as a fine musician ushering in a new era in Los Angeles. If this was the LA Phil’s goal, the concert was a great success, Dudamel came across as a very serious conductor and was seen to be very much at home in American contemporary music and in the mainstream German repertoire. 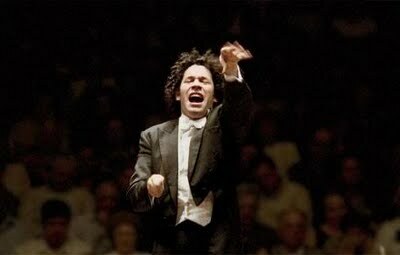 Do we really want a cleaned-up, trimmed down ready for prime time Dudamel? What made him exciting and unique when he first burst on to the scene was his over the top personality on stage and his infectious enthusiasm. It was also the joy of music he conveyed to his young musicians and to audiences everywhere, and the wonderful Latin music he brought with him. For heaven’s sake let Gustavo be Gustavo and we will all be the richer for it, having more fun with music and discovering melodies and rhythms which can make our world a bigger and more interesting place. Gustavo Dudamel brings his Simón Bolívar Youth Orchestra to Toronto (Canada) on October 26 for a week of concerts and educational activities. Both Dudamel and Abreu will be presented with prizes by the Glenn Gould Foundation. Paul E. Robinson is the author of Herbert von Karajan: the Maestro as Superstar, and Sir Georg Solti: His Life and Music, both available at Amazon.com. A few days prior to the Gala concert at Walt Disney Concert Hall, Dudamel led a spectacular free concert at the Hollywood Bowl on Oct. 3. It was a Latino celebration! The community was not ignored, it was embraced and welcomed. owever, my review was based on Dudamel's first concert as music director of the Los Angeles Philharmonic and its national broadcast on PBS. I stand by my comments. Bay and ASO Bring Bruckner Back to Austin!